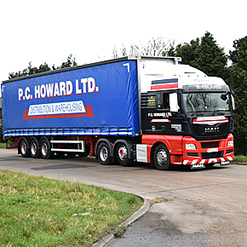 Utilising our own distribution fleet comprising both Articulated and Rigid vehicles, PC Howard Ltd can provide a full load distribution service for all our customers on a nationwide basis. Typically an articulated vehicle can carry 26 pallets, or 52 pallets if they are double stacked . The gross weight of articulated vehicles is the maximum permitted weight of 44,000kgs, which means that they can normally carry a maximum payload of 27,000kgs. Consequently in planning your load we will need to take into account both the volume of the palletised goods and the weight to determine the number of pallets that can comprise of a full load. With our rigid vehicles, the maximum permitted weight is 18,000kgs, which means that they can normally carry between 9,000kgs or 10,000kgs, depending upon whether the vehicle has a tail lift facility - (see tail lifts). The normal maximum number of standard sized pallets that can be carried is 14 or 28 pallets if they are double-stacked. Our full loads distribution services can be offered to customers on a single and multi-drop basis as well as on a specific contract logistics package. Multi-drop services can be offered at particular timed schedules when required. From our experience, we find that we are able to offer our customers bespoke solutions to suit their particular needs because we have the necessary assets in both vehicles and warehousing to provide complete fulfilment servuices which meets client demands. By becoming your logistics partner, PC Howard will improve you supply chain.